Here is what happens when a forgotten area gets remembered. 3 years ago nothing was going on with the old Raybestos asbestos plant. This area was all abandoned buildings, tall weeds, asbestos dust, and piles of junk. The area is slowly being redeveloped and some of the old buildings are being renovated to suit the new owners. 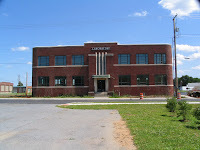 The site was VERY large as it included an office building, laboratory, knitting mills, warehouses, and production plants. The operations completely shut down by 1998. Most manufacturing was gone by the 80's. 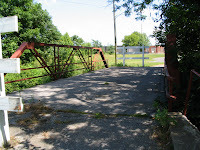 The first photo is of the old Oak St. bridge. This bridge has been unused by vehicles for years. 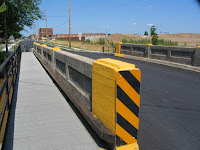 Oak St. itself has been removed on the south side of the bridge. Looking down the rest of Oak St. below the section that is removed. 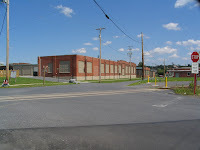 These were all warehouses and other building connected to the plant. Most have auto reconditioning centers or other businesses in them. More of those buildings along Oak St. This is the rail line that once served the complex. 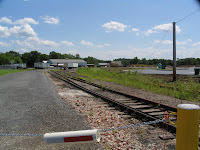 The switch in the foreground is the north point of the wye that the railroad uses to turn equipment on. The line crosses Oak St. and Steigel St. and continues north to Ferralgas on Doe Run Rd. There is no service on it in the summer anymore. This was a little shop of some sort for the asbestos plant. 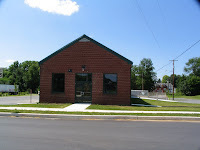 An autobody shop is moving in to it and has completely redone the building. To the right is the abandoned Oak St. bridge and railroad to Ferralgas. 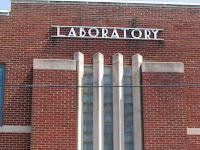 Obviously the old labs. Interesting building. A printing company is moving in and has restored the building quite well- even adding windows that look very similar to what was there. Hopefully the laboratory writing stays! Another shot. 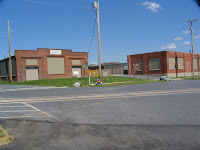 Great architecture for such a plain industrial building. The whole building. Looks great! 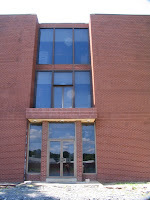 This was the corporate office building. It is slowly being converted into something. 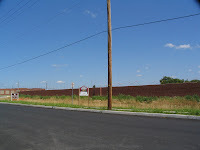 Rumor has it that it will be upscale condos for the dealers that do business with Manheim Auto Auction. This building needs a lot of love. Looking down Steigel St. towards Oak St. Offices would be on the immediate left. 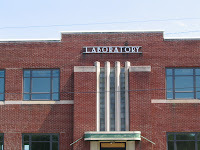 Labs on the right. This was the site of the largest building. The building was bulldozed a few years back. A company called MOJO Barriers is building a large facility on the site now. They make crowd control barriers and will work with Clair Brothers (down the street). 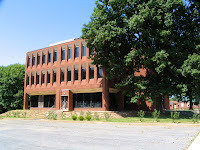 Side shot of the old corporate headquarters. This whole area is very subject to flooding. Last shot is of the newly paved and refurbished Steigel St. bridge. 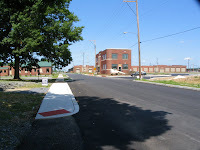 The pedestrian walkway on the side was for the workers that would walk to the plant each day.